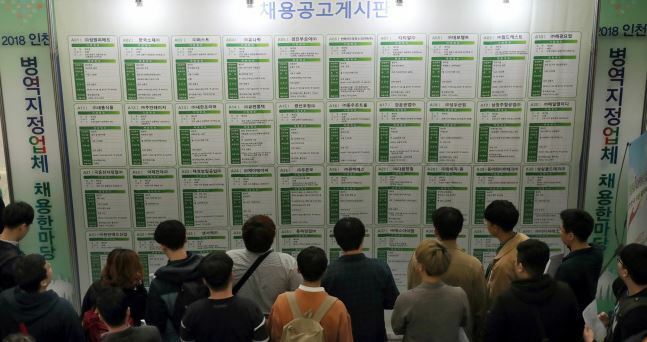 South Korea posted a higher unemployment rate than the United States in the third quarter of last year for the first time in 17 years amid a sluggish job market here, data showed Wednesday. South Korea's seasonally adjusted jobless rate came to 4 percent in the July-September period of last year, higher than 3.8 percent for America, according to the data from the Organization for Economic Cooperation and Development. South Korea's third-quarter unemployment rate was up 0.2 percentage point from three months earlier, while the US figure was down 0.1 percentage point. It marks the first time since the first quarter of 2001 that South Korea's quarterly jobless rate has been above that for the world's largest economy. Still smarting from the fallout of a foreign exchange crisis, South Korea's jobless rate stood at 4.6 percent that year, compared with 4.2 percent for the US. Watchers attributed South Korea's higher unemployment rate to a combination of a strong US job market and local companies' unwillingness to hire new workers amid a slowing economy. In October, the US jobless rate fell to a 49-year low of 3.7 percent thanks to a higher-than-expected increase in the number of non-farm jobs. The brisk labor market sent America's unemployment rate falling to the 3 percent range in the second quarter of last year, a sharp drop from around 10 percent at the height of the global financial crisis a decade ago. In contrast, South Korea's jobless rate has been on a steady rise since it fell to the low 3 percent band in 2011, due to a drop in the working age population and weak employment stemming from manufacturers' restructuring efforts.